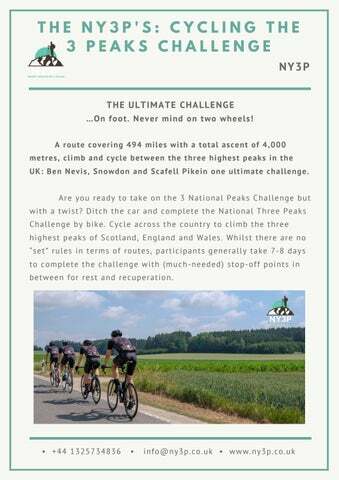 THE NY3P'S: CYCLING THE 3 PEAKS CHALLENGE NY3P THE ULTIMATE CHALLENGE …On foot. Never mind on t wo whe el s ! A route covering 494 miles with a total ascent of 4,000 metres, climb and cycle between the three highest peaks in the UK: Ben Nevis, Snowdon and Scafell Pikein one ultimate challenge. Are you ready to take on the 3 National Peaks Challenge but with a twist? Ditch the car and complete the National Three Peaks Challenge by bike. Cycle across the country to climb the three highest peaks of Scotland, England and Wales. Whilst there are no “set” rules in terms of routes, participants generally take 7-8 days to complete the challenge with (much-needed) stop-off points in between for rest and recuperation. THE NY3P'S: CYCLING THE 3 PEAKS CHALLENGE NY3P WHY YOU SHOULD CYCLE THE 3 PEAKS CHALLENGE IN 2019. Do it for charity. Do it to break records. Do it for the experience. There are an abundance of reasons why we all need a challenge. Cycling the 3 Peaks will push you to your limits and give you the opportunity to create life-long memories along the way. Choose your starting point from North to South or vice versa and, absorb the stunning British scenery along the way. 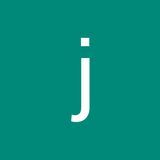 Highlights include the rugged rocks of Snowdon and the breathtaking panoramas across the Lake District. THE NY3P'S: CYCLING THE 3 PEAKS CHALLENGE NY3P PREPARATION IS VITAL A hi gh level of fi tness i s re quired to comp le te th is challenge. To ensure that you a re fully prep ared f or t h e challenge ensure that you: Undergo regular cardio exercise to build stamina and increase strength across the core muscles you’ll be using (cycling AND trekking are very strenuous activities). Plan your route and mark it on a map, making sure to schedule in your stop-offs and accommodation. Invest in good walking boots (for those parts in between pedalling) that are comfortable and sturdy: you’ll be climbing the 3 highest peaks in the U.K after all! Have your bicycle prepared as you’ll be cycling large stretches (potentially exceeding 100 miles a day) and will need to be sure that everything is in good working order e.g. tires and brakes. Keep equipment lightweight. To complete the challenge you’ll need a variety of things from safety gear to snacks; make sure everything can be comfortably carried on your bike.